The creation of the lawnmower has helped generations of gardeners create the perfect lawn. Edwin Budding, an engineer, invented the first lawnmower in 1827. He saw it as a fast and accurate alternative to scything. The first animal-drawn lawnmower appeared in 1840, and the first steam-powered machine in 1890. Chain-driven lawnmowers then came onto the market in 1859. But these early models were bulky. The first lightweight lawnmower didn’t arrive until 1870. Invented by an American, Elwood McGuire, the mower was a great success among gardeners and homeowners. From the 1920s, inventors experimented with petrol-driven rotary mowers. It took 30 years, though, before the first commercial rotary mowers became available. The Ancient Romans used an equivalent of the modern greenhouse to grow vegetables all year round. Instead of glass, the gardeners kept the vegetables under cloth smeared with oil or under sheets of the crystal-like mineral, selenite. Italian gardeners went on to build the first glass greenhouses. The earliest examples date from the 1200s. Over time, the use of greenhouses spread to other European countries, most notably England, France and Holland. Because of their cost, greenhouses appeared mainly on the estates of the wealthy. Universities then took an interest and built greenhouses to contain botanical specimens. In England, the Victorians created greenhouses for exhibitions and botanical gardens. They also added greenhouses to homes, either as part of a house or as a separate building in the garden. 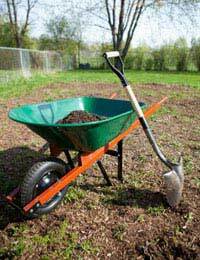 The first recorded mention of a wheelbarrow is to a “one-wheeler” in documents from Ancient Greece. In the fifth century BC, the one-wheeler was a common feature of Greek building sites. It’s hard to find other historical references to wheelbarrows until medieval times. But in the late twelfth century, it’s clear that people used wheelbarrows to transport food, building materials and even children. When gardening became popular in the UK, the wheelbarrow assumed its role as one of a gardener’s most important tools. Until well into the twentieth century, most wheelbarrows were wooden. Modern wheelbarrows are often metal, plastic or a combination of both materials. The garden shed has a special place in British life. It is a storage place for garden tools, and a workshop in which DIY enthusiasts, model makers and inventors spend many productive hours. Sheds have appeared in one form or another throughout history. The modern wooden garden shed derives from the Victorian era. It housed garden tools and fuel. Garden ponds date back to Ancient China and Persia. Since then, every culture with an interest in gardening has used them. The main purpose was to keep fish and to add a relaxing feel to a garden area. Ponds are not really an invention. They are an attempt to recreate nature in a garden environment. Even formal ponds use natural elements such as lilies and other aquatic plants. Since the 1980s, waterproof liner and moulded plastic have made garden ponds more affordable and more popular. The result has been a proliferation of ponds of various sizes and shapes across the country.